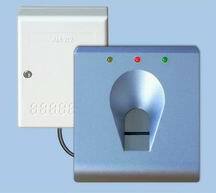 BioKey Gate is the newly developed end-product, consisting of two separated units which guarantee a very high security. The fingerprint sensor and the fingerprint recognition module (BioKey 3000 module) could be installed outside next to the door, whereas the door opener control (relay) is inside and therefore protected against manipulation. The wiring between these components could reach more than 10m. End-product with housing: The modern designed housing with its finger slide of stainless steel is enclosing the robust Atmel linesensor. The integration on wall is very easy. User-friendly handling: The system could be handled by a masterfinger concept, no PC or special knowledge is needed.